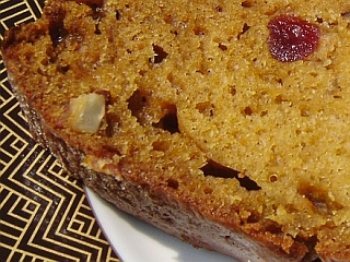 A deliciously dense, moist pumpkin bread that is studded with tart, ruby red cranberries. Fabulous for breakfast or as a snack, festive enough to include on a holiday table and makes a terrific tea bread all autumn long. Simply a delicious, irresistibly moist and flavorful bread...it also freezes well! Grease two 9- by 5-inch loaf pan, dust with flour, tapping out excess. Spread chopped nuts on baking sheet, toast until fragrant, 5 to 10 minutes. Set aside to cool. In a mini-food processor, process raw cranberries until coarsely chopped, or chop by hand. Set aside. Whisk flour, baking soda, pumpkin pie spice, salt and baking powder together in a large bowl. In a medium bowl, combine oil and sugar together with an electric mixer. Beat in pumpkin and cranberry sauce, until smooth. Lightly fold pumpkin mixture into dry ingredients with a spatula until just combined and batter looks thick and chunky. Fold in nuts and raw cranberries, if desired. Scrape batter into prepared loaf pans. Bake until golden brown, bread has shrunk slightly away from sides of pan and a tester inserted in center comes out clean, 60 to 65 minutes. Cool in pan for 5 minutes, transfer to wire rack to cool. (The bread can be wrapped with plastic wrap and stored at room temperature for up to 3 days or frozen for up to 2 weeks.) For glaze: In a small bowl, mix 1 cup powdered sugar, 1/4 cup (thawed) undiluted orange juice concentrate and 1/8 teaspoon ground allspice until smooth. Drizzle over bread just before serving, if desired..